The Major League Baseball World Series is all to play for after Houston’s dramatic 11 inning win over the Dodgers in game 2. The World Series’ first game was a pitching duel that saw the Dodgers win 3-1. Clayton Kershaw threw well, picking up the win. Game 2 saw the bats come alive. The Astros scored in each of the last four innings as the game went to 11. Game 3 is on the horizon (Friday night), and the World Series is evenly matched as the teams shift to Houston. According to World Series winner projections, the Dodgers are still the favorite to win. Although the series is on its way to Houston for the next three games, the Astros are just 46% likely to win the series. The Dodgers are 54% likely to win it all. But after Los Angeles’ poorly managed bullpen performance in game 2, the Astros may have more of a shot than the number crunchers are predicting. 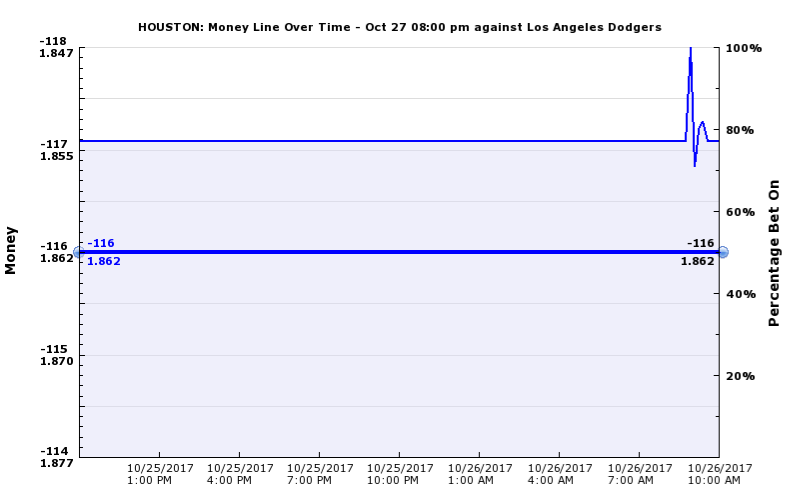 Houston is the moneyline favorite going into Friday’s game. The Astros are -117 as Lance McCullers takes the mound. He was just 7-4 during the regular season. McCullers will go against Yu Darvish, who finished the season at 10-12. On the field, both the Astros and Dodgers have been evenly matched so far. But ZCode System’s Playoff Simulator sees Houston about to take flight and go into orbit. The Playoff Simulator has the Astros winning the World Series in five games, which means the team will sweep the Dodgers in Houston. Game 5 is certain to see Kershaw back on the hill, if the Dodgers are up against elimination. He could stave off elimination and get the series back to Los Angeles. The Dodgers 7-6 loss in game 2 was courtesy of one of the wildest World Series games in recent years. But the Dodgers run through the postseason so far has really overshadowed the team’s lackluster end to the regular season. Los Angeles had a great first half of the season, and posted a 61-29 record. The second half saw the team fall off and record a 43-29 record. Late August and early September were incredibly bad, and over all, the Dodgers lost 22 of their last 34 games. The team posted a below .500 September. In the last 10 years, only one team has won the World Series with a below .500 win percentage. That team was the 2015 Kansas City Royals. A great end to the season has a lot to do with team performance in the World Series. While Los Angeles struggled in September, Houston won 20 of its 28 games. The team’s performance during the month has been carried over into the playoffs. Houston at home for games 3, 4, and 5 should frighten the Dodgers. Los Angeles look vulnerable, and with Darvish on the mound, Houston can capitalize on its momentum from game 2. Click Here To Secure Your Totally Hands-Free Baseball Picks! URGENT: Knock-out  your book tonight!